April is the middle month of Leo Term, and as the new calendar will show you, our great-star-of-the-month for April is Regulus, the brightest star in constellation Leo, the Lion of the Heavens. 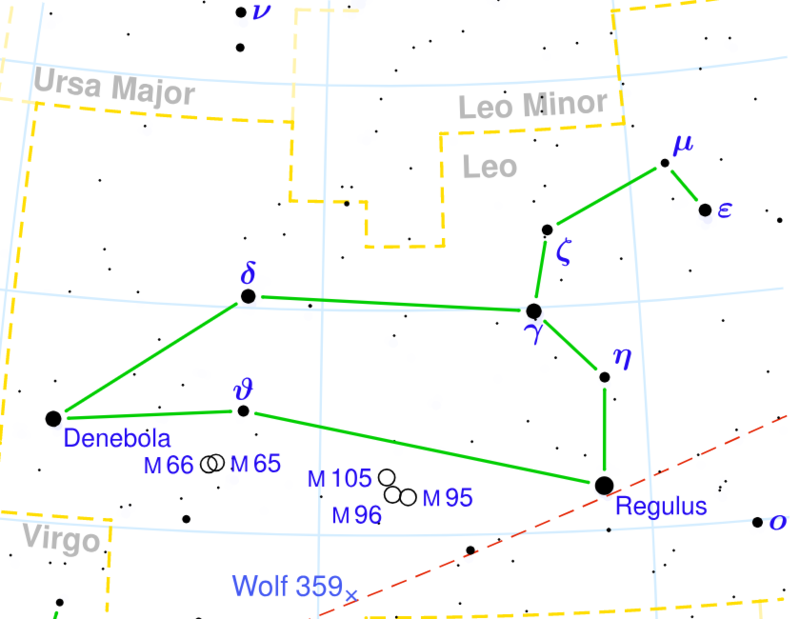 Its formal designation is α Leonis — “alpha of Leo.” Leo and Regulus are high in the southern sky in the early evening this month, passing over to the west as the night goes on. The planisphere on the front of your star atlas will help you locate Regulus, and that’s plenty for beginning students — your little lesson is done. If you want to get more advanced, the Wikipedia page on Regulus is packed with additional information on everything from astrometrics to cultural history. The Regulus we see is blue-white, but that Regulus is actually just the primary star (Regulus A) of a quadruple system that is arranged into two pairs: Regulus A and a suspected white dwarf that is detectable only spectroscopically, and Regulus B and C (a pair that is visible as a single star in small telescopes). The B-C pair orbit each other, and together they orbit the primary star Regulus A (and its own tiny companion). ❡ Alpha and beta and gamma, oh my: Most of the principal stars within each constellation have both old vernacular names — Vega, Sirius, Arcturus, and so on — as well as more formal scientific designations. The German astronomer Johann Bayer (1572–1625) devised the formal system of star designations that is still in common use today. 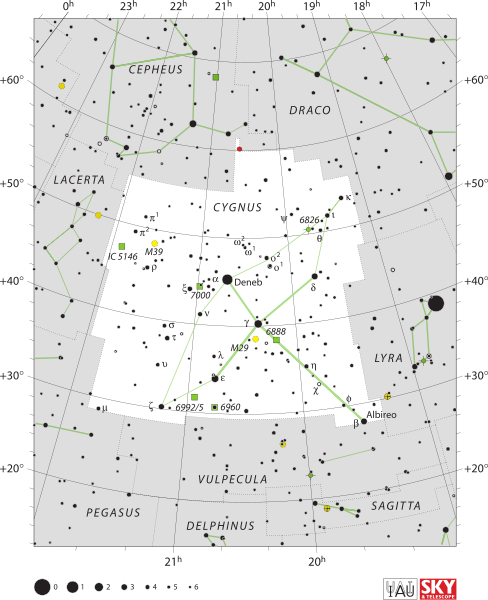 In Bayer’s system, the stars in each constellation, from brightest to dimmest, are assigned a lowercase letter of the Greek alphabet: α (alpha, brightest), β (beta, second brightest), γ (gamma, third brightest), δ (delta, fourth brightest), and so on. 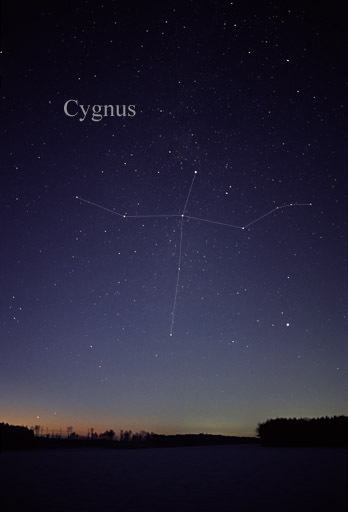 This letter designation is combined with the Latin name of the constellation in its possessive (genitive) form: Lyra becomes Lyrae (“of Lyra”), Canis Major becomes Canis Majoris (“of Canis Major”), and so on. 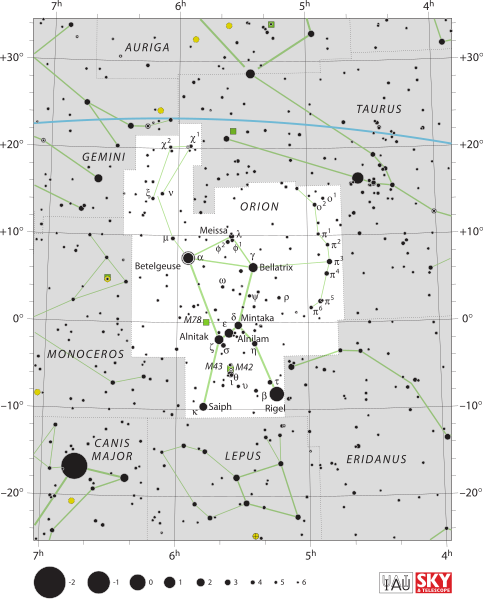 The brightest star in the constellation Lyra (the star Vega) thus becomes α Lyrae (“alpha of Lyra”), the brightest star in Canis Major (the star Sirius) becomes α Canis Majoris (“alpha of Canis Major”), and so on, through all 24 Greek letters and all 88 constellations. How bright would you expect, say, the σ (sigma) star of Orion to be? 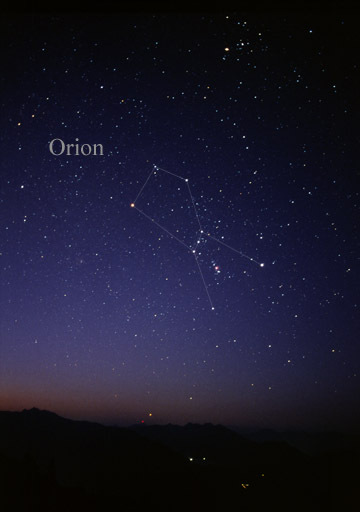 Not very bright — it’s far down the alphabet — but σ Orionis happens to be the top star of Orion’s sword, so even though it’s not very bright it’s still notable and easy to locate on a dark night. Today is the March equinox — we call it the vernal or spring equinox in the northern hemisphere, but in the southern hemisphere it’s the autumnal or fall equinox. The vernal equinox is the first day of spring (astronomically speaking), just as the autumnal equinox is the first day of fall (astronomically speaking). 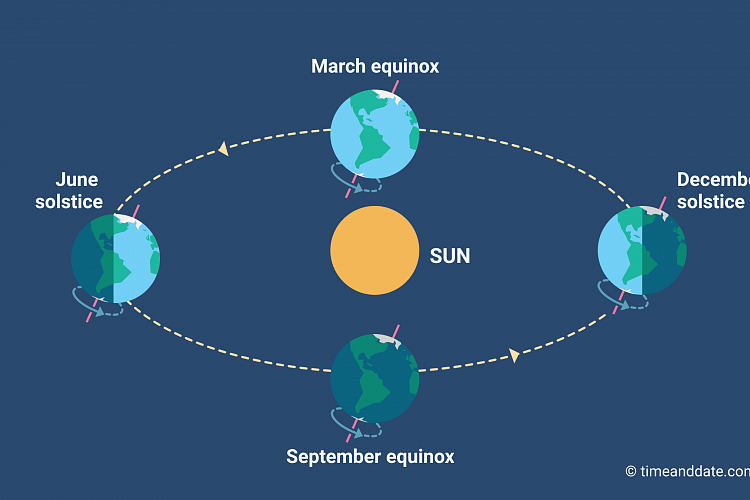 The seasons occur because the earth’s axis of daily rotation is not quite perpendicular to the plane of the earth’s annual orbit around the sun (it’s tilted by about 23º). The two solstices occur at the points in the annual orbit when the axis is tilted most directly away from the sun (in December, on the first day of northern-hemisphere winter), and most directly toward the sun (in June, on the first day of northern-hemisphere summer). The two equinoxes, in March and September, occur at the points in the annual orbit when the earth’s axis is “sideways” to the sun (so to speak), making the intervals of daylight and darkness equal (or very nearly so). 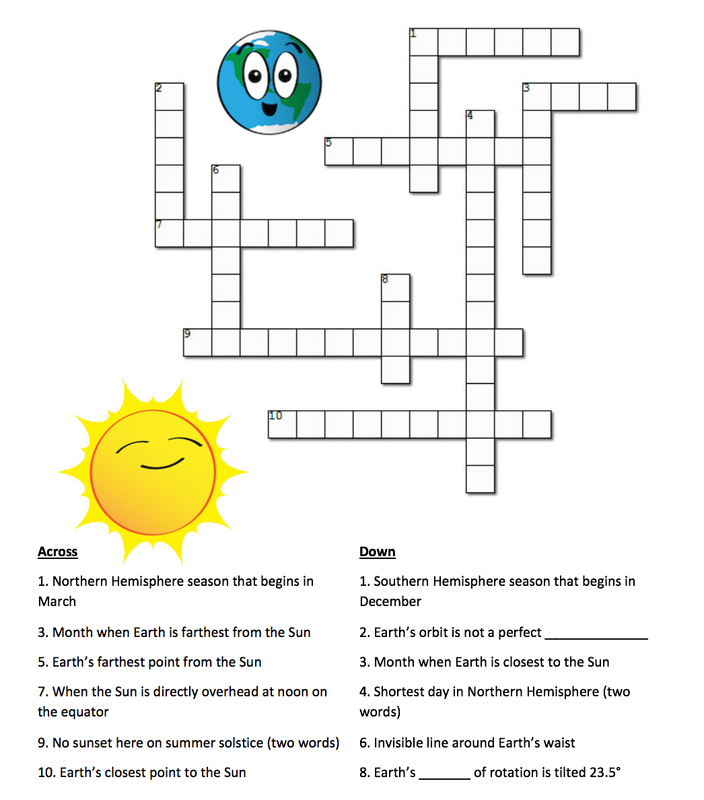 NASA has a fun educational crossword puzzle for kids that’s filled with seasonal and astronomical vocabulary — solstices, equinoxes, and more. You can print out your own copy at NASA’s “For Educators” website. Every Sunday we put up our weekly States & Countries posts that invite you and your students to tour the U.S. states and the countries of the world with us. Just spend a few minutes each week finding the countries and states with your atlas and almanac and reading a fact or two about them, and over the course of the year, without even realizing it, your students will absorb a wealth of cultural and geographical information. Today marks the beginning of our Spring Term — Leo Term — here in the River Houses. Leo Term runs from March through May. We put great stock in the educational value of the calendar in the River Houses. The calendar is the framework on which we human beings hang a great many of the facts we know about the world: historical events, natural phenomena, personal reminiscences, the seasons, the sun and moon, the planets, the stars. A key part of every student’s intellectual development is the development of “calendar sense” — a sense of time and history. This calendrical division is a new and open-ended idea that we think has a great deal of educational potential. We’re looking forward to its development and elaboration as time goes on. As you think about your own homeschool year, think about how different parts of it — curricular, co-curricular, social, or recreational — might be informally arranged into these four three-month terms. You could have a different decorating theme in your classroom each term, for example, or you could schedule a regular trip to a special place at the beginning of each term to see how the seasons change. You could group your curricular work by term, or set goals at the beginning of each term that you want your students to meet. At the end of each term your students could assemble a quarterly portfolio of their accomplishments. With a little imagination you will be able to come up with a clever and comfortable arrangement and a new way to think about the structure of your educational year. Today is the first day of Leo Term, named for the Great Lion of the Heavens who is rising in the east in the evening now and who will be passing overhead throughout the spring. Why not spend a little time out after dark with your students over the next three months and locate the Great Lion as he makes his nightly passage to the west. Once you learn to spot him, you’ll have a friend for life. ❄️ THE DECEMBER SOLSTICE is Here! Today is the December solstice — we call it the winter solstice in the northern hemisphere, but in the southern hemisphere it’s the summer solstice. The winter solstice is (astronomically speaking) the first day of winter, just as the summer solstice is (astronomically speaking) the first day of summer. 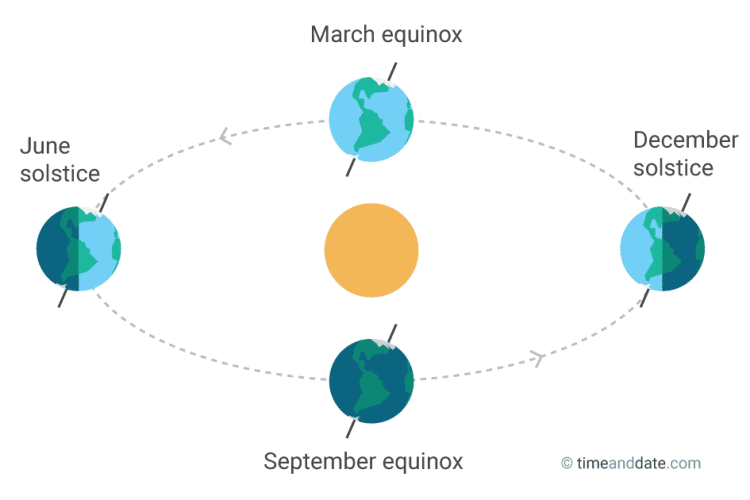 The seasons occur because the earth’s axis of daily rotation is not quite perpendicular to the plane of the earth’s annual orbit around the sun (it’s tilted by about 23º). The two solstices occur at the points in the orbit when the axis is tilted most directly away from the sun (in December, on the first day of northern-hemisphere winter), and most directly toward the sun (in June, on the first day of northern-hemisphere summer). The two equinoxes, in March and September, occur when the earth’s axis is “sideways” to the sun (so to speak), making the intervals of daylight and darkness equal (or very nearly so). NASA has a fun educational crossword puzzle for kids that’s filled with seasonal vocabulary — solstices, equinoxes, and more. Today marks the beginning of our Winter Term — Orion Term — here in the River Houses. Orion Term runs from December through February. We put great stock in the educational value of the calendar in the River Houses. The calendar is the framework on which we human beings hang a great many of the facts we know about the world: historical events, natural phenomena, personal reminiscences, the seasons, the sun and moon, the planets, the stars. A key part of every student’s educational development is the development of “calendar sense” — a sense of time and history. This calendrical division is a new and an open-ended idea that we think has a great deal of educational potential. We’re looking forward to its development as time goes on. As you think about your own homeschool year, think about how different parts of it — curricular, co-curricular, social, or recreational — might be informally arranged into these four terms. You could have different astronomical decorating themes in your classroom, for example, or you could schedule a regular trip to a particularly special place at the beginning of each term to see how the seasons change. You could group your curricular work by term, or set goals for your students to meet each term, or have your students write achievement reports at each term’s end. With a little imagination you may be able to come up with a clever and comfortable arrangement and a new way to think about the structure of your educational year. 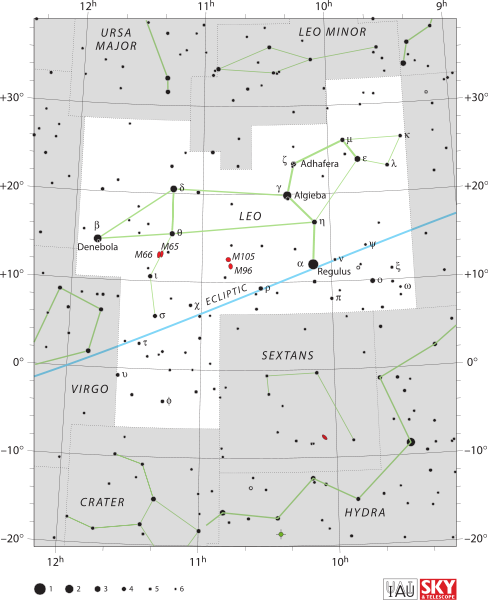 Today is the first day of Orion Term (December–February), named for the Great Hunter of the Heavens who is rising now in the east each evening about 8:00 p.m. and who will be passing overhead throughout the winter. 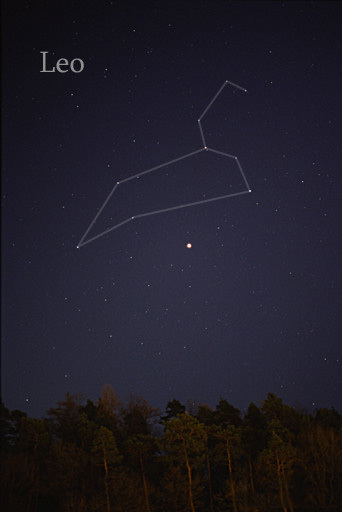 Why not spend a little time out after dark this term with your students and locate the Great Hunter as he makes his nightly passage to the west. Once you learn to spot him, you’ll have a friend for life. We put great stock in the educational value of calendars here in the River Houses. The calendar is the framework on which we hang almost all the facts we know about the world: historical events, natural phenomena, personal reminiscences, the seasons, the sun and moon, the planets, the stars. This calendrical division is a new and open-ended idea that we think has a great deal of educational potential. We’re looking forward to its development as time goes on. As you think about your own homeschool calendar, think about how different parts of it — curricular, co-curricular, social, or recreational — might be informally arranged into these four three-month terms. You could have a different decorating theme in your classroom each term, for example, or you could schedule a regular trip to a special place at the beginning of each term to see how the seasons change. You could group your curricular work by term, or set goals at the beginning of each term that you want your students to meet. At the end of each term you could have your students assemble a portfolio of their recent accomplishments. With a little imagination you should be able to come up with a clever and comfortable arrangement and a new way to think about the structure of your educational year. Why not spend a little time out after dark this term with your students and locate the Great Swan as it makes its nightly migratory flight to the west. Once you learn to spot it, you’ll have a new autumnal friend for life. 🍁 THE SEPTEMBER EQUINOX is Here! Today (22 September) is the September equinox — we call it the autumnal or fall equinox in the northern hemisphere, but in the southern hemisphere it’s the vernal or spring equinox. The autumnal equinox is (astronomically speaking) the first day of fall, just as the vernal equinox is (astronomically speaking) the first day of spring. The seasons occur because the earth’s axis of rotation is not quite perpendicular to the plane of the earth’s annual orbit around the sun (it’s tilted by about 23º). The two solstices occur at the points in the orbit when the axis is tilted most directly away from the sun (in December, on the first day of northern-hemisphere winter), and most directly toward the sun (in June, on the first day of northern-hemisphere summer). The two equinoxes, in March and September, occur when the earth’s axis is “sideways” to the sun (so to speak), making the intervals of daylight and darkness equal (or very nearly so).